from 15 pcs. 1,51 EUR ea. from 40 pcs. 1,34 EUR ea. from 80 pcs. 1,23 EUR ea. 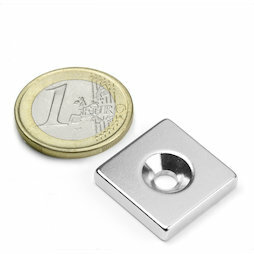 Block magnets with a square base area and a countersunk borehole. They can be fastened with a countersunk head screw. They are only 4 mm thick and therefore very discreet for hanging up signs, tools, etc. Especially suitable for cabinetmaking, kitchen installations, booth and store construction, signage technology, etc. 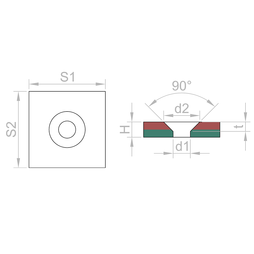 We also carry round Pot magnets with counterbore screw-on.